Once again, I want to begin my Address with words of thanks – thanks which are as well-deserved as they are inadequate. For our diocesan staff, I and you should be especially grateful – to my Executive Assistant, Lauren Kinard; to the Archdeacon, Callie Walpole; to the Communications Director, Holly Behre; and to the Administrative Assistant, Andrea McKellar. I am the envy of my colleagues in the House of Bishops with this fine staff, even though each staff member is officially “part time.” Our diocesan officers likewise do noteworthy and admirable work, and we are certainly grateful to them – Tom Tisdale, Chancellor; and Jim Taylor, Treasurer. 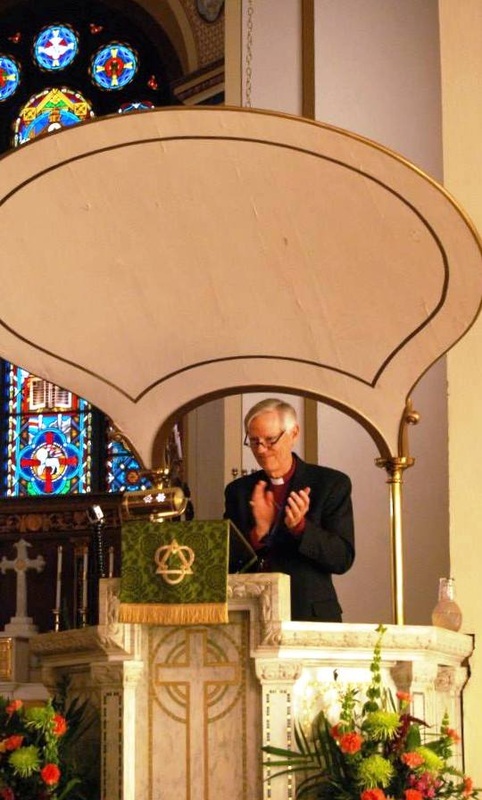 Along with these folks, of course, many others – many of you who are present, in fact – have labored hard and well in the vineyard which is The Episcopal Church in South Carolina. Please accept my thanks and the thanks of this convention gathered. Also on behalf of us all, I want to thank the staff and parishioners of the Church of the Holy Communion. For your care in making preparations and for your graciousness in extending hospitality to us all, we are grateful indeed. Another significant object of our thanks are the people of our newly recognized mission congregations – Church of the Messiah, Myrtle Beach; the East Cooper Episcopal Church; and The Episcopal Church in Okatie. We are grateful for your efforts, and we join you in this time of celebration. Thanks, also, to our guests at this convention, for joining us here – Bishop James Tengatenga, Canon Tom Brackett, Canon Mark Stevenson, and Paul Nix. You honor us by your presence. In addition, a personal word of thanks to my wife Annie surely is appropriate. I know that you join me in this indication of gratitude because on the occasional times that Annie does not accompany me to some event, my presence alone is often met with disappointment. So, thanks to you, Annie, on behalf of me and of everyone here. As we turn our attention to the past year or – more accurately – to the past nine months since the last convention, we may appropriately observe that it has been a busy time! We have found ourselves in the headlines more often than I would have wished and, sometimes, for reasons that are not very appealing. For instance, we have spent more time in court and on legal matters in general than is probably in the best interests of the church. As we travel this journey, a particular biblical image may be especially enlightening. The Exodus event seems to relate to our experiences in various ways. For instance, I have heard from many of you about the sense and reality of oppression in this part of the church, in previous times. Then, a kind of separation and exodus took place. And now, people of God, we find ourselves traveling through the wilderness. Our Red Sea may be Lake Marion; our wild beasts may be forty-four lawyers and a judge; and our Mt. Sinai may only be Mt. Pleasant. But, we do know something about being pilgrims in the wilderness! In this time of wilderness wandering, we realize that we cannot make it on our own. We must rely on each other and on God’s grace – known through many people – to help us through these times and this place. And – very importantly – we have hope for a better time and place … a promised land. We are being led toward that destination, even though we may sometimes seem to wander along the way. In the wilderness of this time, I want to hold up two essential marks of our community life on the journey – identity and accountability. Identity and accountability are landmarks for us to keep in our sight as we travel through the wilderness. Indeed, we must remember who we are, and we must remember to whom we are accountable – or else, we will lose our way. We are The Episcopal Church in this part of the Kingdom of God. As such, we possess a wonderful heritage of faithfulness in prayer, commitment to community, and dedication to service. We are marked by the cross in baptism, as the sign of our identity. This baptismal seal, indicating Christ’s presence, is confirmed at various points on our journey. Thus, we affirm our commitment to the way. And, we are sustained by Christ himself in Eucharist as well, providing strength for the journey. Indeed, we are The Episcopal Church here – as we have been in the past and as we will continue to be. Also, in terms of our identity, we are the Anglican Communion in this part of God’s Kingdom, regardless of what you may have heard or read elsewhere. The Episcopal Church is the only recognized member of the Anglican Communion in this country – and that membership provides us with a sign of our catholicity as a church. That is, the Anglican Communion provides the sign that we are members of Christ’s one, holy, catholic church. Please recognize that the body in convention here represents the Anglican Communion in this part of South Carolina. It is important for us to remember such indications of our identity – who we are – especially in this wilderness time of our journey. We also must remember to whom we are accountable, as we travel along this way. We are accountable, first of all, to God who created us and who sustains us, as Christian pilgrims. That accountability is lived out, in practical ways, through The Episcopal Church – that part of the Body of Christ of which we are members. Without such practical accountability, we simply would be fooling ourselves about any claim of authenticity and authority. Like the people of God in the wilderness, we need to be held accountable to our pledge of faithfulness. Without accountability, our pledge would lack substance and meaning. Therefore, we cannot make up our own rules because we are accountable to a greater body. Such membership curbs our tendencies toward self-righteousness and self-deceit – and, in biblical terms, toward sin. We need each other within the Body of Christ – and as parts of the Body of Christ – to hold us accountable. Therefore, on this journey, I call your attention to those fundamental marks of our life in community – identity and accountability. May we give thanks to God – regularly and often – for who we are in the Body of Christ. And may we not forget as well the importance of accountability – as parts of that Body – in the life and journey of faith. Related to those topics of identity and accountability is the matter of the on-going task of reorganizing our diocese. To continue with the idea and image of journey, we are repacking … and we have fewer bags to carry now. As we look at this matter, perhaps remembering some recent history at this point will be instructive. After the former bishop and Standing Committee left The Episcopal Church, there was no diocesan organization left for the church here. Church canons are clear about authority in terms of bishop and Standing Committee. However, our canons do not anticipate that neither of those authorities will be present. Thus, what developed – thanks primarily to Tom Tisdale – was something called a “Steering Committee.” As the only loosely organized group, in pre-organizational days, this body had a wide variety of responsibilities. In fact, it did everything that got done, as The Episcopal Church here, beyond local church communities. And, this group steered us to the point that a bishop and a Standing Committee were elected for The Episcopal Church in South Carolina. As you might imagine, members of the former Steering Committee provided significant leadership in various groups of the reorganizing diocese – groups like the Standing Committee and the Diocesan Council. Soon afterwards, though, it became my responsibility to remind each group that we do not have a Steering Committee, which did everything, any longer. Rather, we now have a Standing Committee and a Diocesan Council – each with distinct and separate responsibilities. Thus, you see, matters of identity and accountability continue to be significant ways to mark who we are and what we are called to do, as we reorganize ourselves as a diocese. In theological terms, these are important steps, as we grow into that part of the Body of Christ we are called to be. More recently, our Finance Committee has taken on matters relating to identity and accountability, also, as we continue this journey of reorganizing. In the process, particular and specific responsibilities have come to light, in addition to handling diocesan assets – for instance, facilitating church audits, developing diocesan stewardship practices, and evaluating personnel and compensation. Some of these responsibilities appropriately fall within the prevue of the Finance Committee, while others do not. Therefore, this committee has added some matters to its job description, and we have identified other groups to accomplish other responsibilities. Again, then, as we continue the journey of reorganization, we need to ask questions related to identify and accountability … and, then, to put into practice the answers which come to light. Soon after the first of next year, we plan to initiate a capital funds drive, to help us take next steps on our diocesan journey of faith. Specifically, we must address two financial needs beyond what the annual budget can meet. Those needs are funding for a full-time bishop and additional support for our mission congregations. You will hear more about this capital funds drive soon. When you do, please be aware of the importance of addressing these needs on our journey ahead … and please respond generously. I want to highlight a specific biblical image here that I have mentioned already in this Address. St. Paul often wrote to Christians elsewhere, and he used the analogy of the church as the Body of Christ. For instance, to the church in Rome, he wrote, “As in one body we have many members, and not all the members have the same function, so we, who are many, are one body in Christ, and individually we are members of one another” (12:4-5). In our efforts toward reorganizing, one goal should be to define particular responsibilities for each part of the body, for the good of the whole. Identity and accountability provide important measures for this task. The whole Body of Christ offers the framework. And, it is that whole Body of Christ that we pray benefits from the particular efforts and offerings we are able to make. I want to sum up this combination report and reflection by asking several questions, which I hope you will find compelling. These questions intend to direct our attention to who we are and to what and why we are called to be – identity and accountability as the church. Further, I hope that dealing with such questions will help us understand the part we are called to play in the whole Body of Christ. Then, after asking the questions, I want to share a story with you … a story which has helped me address these very questions. First, then, how are we – as churches and as a diocese – living into our identity as the Body of Christ in the world today? That really is the foundational question. How are we – as churches and as a diocese – living into our identity as the Body of Christ in the world today? The next two questions deal also with the matter of accountability, given our identity. Secondly, then, how can we grow more fully into the part we are called to play in Christ’s Body? And finally, how can we hold this image of the Body of Christ before us, more convincingly, so that we and the world may recognize our very reason for being? It seems to me that these questions serve to provide us with a clear and definite framework for our self awareness, as churches and as a diocese. Further, these questions direct us outwardly, in mission, toward the world for which our Lord gave his life. Now, let me offer you a story about an experience I had some years ago – a story that helps me consider questions like the ones I just posed to you. This is a story that some of you have heard before. With apologies to you, though, I offer it here. While I served as rector of Church of the Resurrection in Greenwood, South Carolina, we opened a soup kitchen in the church basement, in response to a community need that the police department there had identified. Some months later, I was walking downtown one day. And, a homeless man accosted me. We talked for a few moments, and then he asked me what church I served. I pointed across the town square and said, “That one, over there.” His response was something I have not forgotten. “Oh, that’s the place that feeds people”, he said. Now, I was just about to point out that we did a lot more than that. We have worship services; we provide Christian education; we offer fellowship opportunities. But then, I closed my mouth and nodded. Indeed, I realized the church often is known in ways less appropriate to our mission. “That’s the place that feeds people.” That will do, just fine. So, again, the questions I have for you today are these. How are we – as churches and as a diocese – living into our identity as the Body of Christ in the world today? How can we grow more fully into the part we are called to play in Christ’s Body? And, how can we hold this image of the Body of Christ before us, more convincingly, so that we and the world may recognize our very reason for being? My friends, without a clear answer to these questions, then we lack integrity as we identify ourselves as the church which claims Jesus as Lord and Savior. May we, therefore, claim our identity and respond to our accountability – as The Episcopal Church in South Carolina – even as we travel through the present wilderness. Further, may we grow into full membership in the Body of Christ, living out the calling we are receiving from Jesus himself – even now. Thank you for who you are and for your efforts to respond to who you are called to be, in this time and in this place! The Bishop joins the congregation in applauding people for whom he expressed thanks in his address.